Matthew Modricker services one of his candy machines. Photo provided. Matthew Modricker's business sense bloomed when he was a high school student in Bellefonte. Instead of picking up a part-time job, Modricker found other ways to earn money. He used Craigslist to buy old video games and after he got them he would sell them at a mark up on Amazon. He also collected antiques, enough that he became friends with the owner of the Great Mish-Mosh on South Allegheny Street who let him set up a stall in the antique and vintage store to sell his wares. So Modricker has long had a unique entrepreneurial spirit, and after the end of his freshman year at Penn State last spring he decided to become a business owner. He now owns and services candy vending machines located in area businesses. Once again, Cragslist came in handy. "I put an ad up on Craigslist – for whatever reason vending machines popped into my head. ... I knew it was passive income which meant I could earn money sitting here talking to you while I’m not actually at the location of the machine," Modricker said. "I obviously couldn’t do something where I had a storefront because I’m a student and that doesn’t really work out. So a vending machine was a great way to make passive income and had low barriers to entry. There wasn’t much capital I needed to start up. I posted an ad and I was just looking at like seven machines. But a couple contacted me with an offer for their entire candy machine business." Frank and Paula Belella of Houtzdale, who operated the business with their son Jim, talked with Modricker about the business and Modricker went to Penn State's Small Business Development Center for assistance. "They were so helpful, they still are. I worked with (SBDC business consultant) Linda Feltman," he said. "They helped me write a buyer’s agreement and from there I purchased all the assets and [the Belellas] kept the machines in their current locations." Now Modricker has 23 machines in operation, but more that he is looking to get into new locations. About once a month he travels to each location -- often with an assist from his father -- and services the machines. He takes out the money, fully stocks them, makes any repairs that are needed and keeps up relationships with the businesses that host the machines. And he spends time trying to get his machines into new businesses. It's not always an easy road. Even though he owns the business with existing locations, is fully insured for medical and liability and has professionally made advertisements, he's found it tough to crack into new markets. "I don’t know if it was just because I was starting out... I don’t think they thought of me as a business owner aside from just being a college kid. That would be my hardest thing," he said. But it has been a great experience for Modricker, and he's using it as an opportunity to give back. The former owners had established a childhood cancer foundation that benefited from the candy machines' proceeds. He looked into continuing that, but both he and the Belellas found the transferring the charity to him to be a difficult process. So instead Modricker now has a partnership with the United Way, with stickers on each machine noting that a portion of the proceeds go to the organization. "The United Way is the world’s largest non-profit so I know the money is going to good use," he said. "I was thinking of something really broad that people could relate to, and I do really enjoy giving back. Having a sponsorship for a charity also helps you get in the door. It shows it’s for a good use and not just for you to make money. You will be giving back to the community as well." Once Modricker became interested in pursuing a business career -- he's now a sophomore supply chain management major in Penn State's Smeal College of Business -- owning his own business became his goal. "I got really lucky that I could fulfill that pretty fast," he said. "Not many kids in college can say they own their own small business. It’s helped me out with interviews with some very large companies and was a great talking point." In the long term, Modricker, who also now works part-time at Penn State's Berkey Creamery, wants to open his own storefront business. 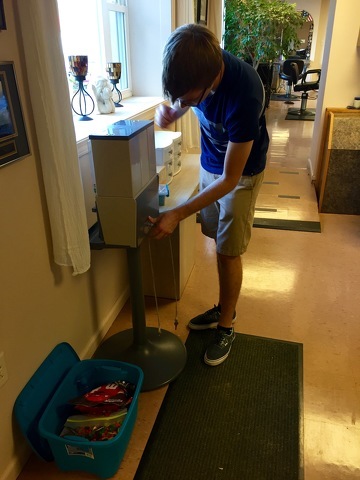 He'll continue with the candy machine business for as long as he can, but also sees it as an opportunity for a like-minded student in the future. "The vending machine business is a great starter," he said. "This is something that maybe I will do through college and maybe take it to someone else who is going down the same career path as mine. 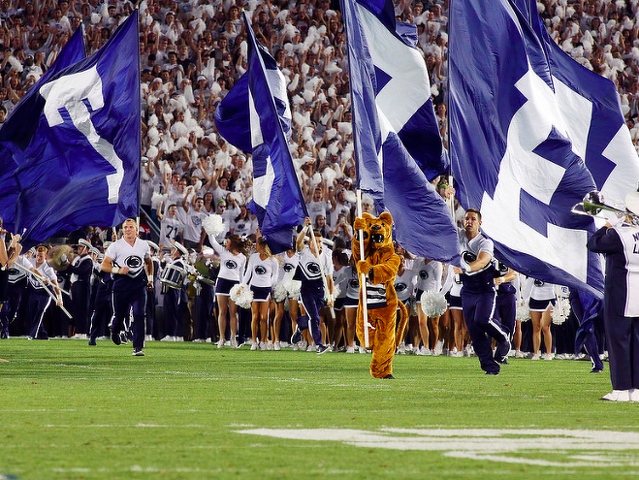 Penn State offensive lineman Noah Beh has been suspended for a violation of team rules coach James Franklin said on the Big Ten teleconference Tuesday. Franklin, who didn't go into specifics about the suspension was asked about potential players that could replace offensive right tackle Andrew Nelson who sustained a season-ending injury in Penn State's win over Maryland this past weekend.